- Walls: number of sections, thickness, type, height, length, characteristics, defenses, etc. The majority of the book is comprised of castle layouts that are mapped using Judges Guild's Campaign Hexagon System." "A booklet of 55 light gray hex fields ideal for use in mapping with colored fel-tipped markers. Hexes are numbered and .3" in size, making them .2 mile for the standard D&D 5-mile wilderness hex. In addition, the 64p booklet has six pages of tables for generating forests, wilderness encounters, flora and fauna, terrain features, and the other myraid details of a wilderness campaign." "Can you win the race against time as the four fiends make their bid for world supremacy? This 16 page booklet contains maps, charts and guidelines for use with the Villains & Vigilantes rules system." I am not really sure where these came from or what they came with. I have three of them that are all identical. I suspect back in the day I bought some "bundles" and this was in the shrinkwrapped package....or I got them in a lot purchase off eBay. Not sure but just putting them out there so others can see it and maybe somone can tell me what it came from. "A 48-page package of five small, versatile dungeon scenarios, or "mini-dungeons". All are set in the Judges Guild Wilderlans campaign setting, though they can easily be used in any campaign. Each one is a complete adventure and include separate maps for players and Judge, full backgrounds and accompanying rumors, all thoroughly illustrated in the Jaquays tradition. The Lost Temple, The Tomb of Aethering the Damned, The Lone Tower, Willchidar's Well, and the Crypts of Arcadia awaits the stalwart players." "This new and exciting adventure book holds ten complete adventures! The Beast of the Blackwater, The Mountain of Fire, The Temple of Allisstanis, and many more. Each include maps, full background information and accompanying rumors." "FIVE scenarios, complete adventures with judges and players maps, full background & accompanying rumors. Ready to add to any campaign." 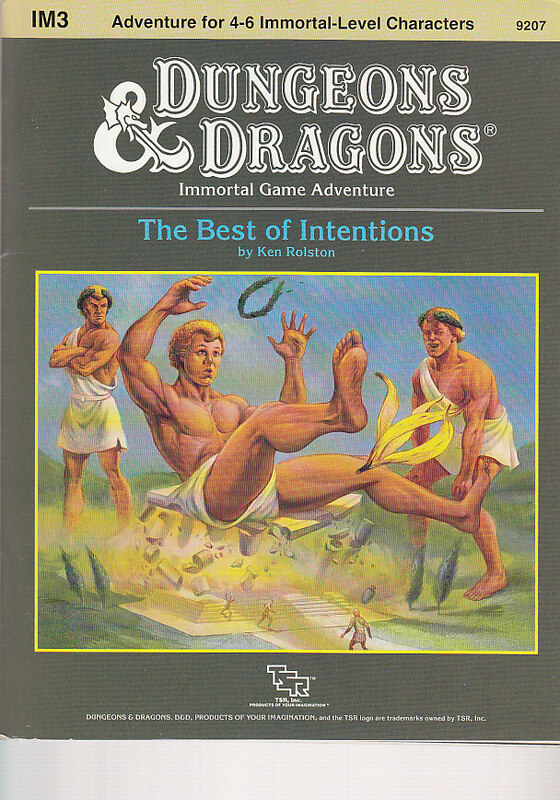 "A 48-page package of five versatile dungeon scenarios or "mini-dungeons". Each one is a complete adventure, including separate maps for Player and Judge, full Backgronds and accompanying Rumors. Dragonspate Geyser, Castle Potunda, Demon Temple of Thoth, Temple of the Lizardmen, and Circle of the Shifting Stones awaits the stalwart players." "The Book of Ruins is a set of "mini" dungeons designed to be used to spice up an existing campaign or to be run alone as short "one-off" dungeons. Most can be run in one to four hours, so they can fill the void in a normal overland campaign without converting the campaign into a long dungeon adventure." "Complete science fiction mapping system. Four different mapping grids. Special map key & record pages." "A simple accessory to aid GMs in mapping out science fiction scenarios and campaigns. In addition to having numerous blank "mapping grids", which can be used for anything from a solar system down to the rooms of an installation, the book also includes mapping symbols to be used in such maps." "Thrilling Locations. An excursion into the World of Luxury. Experience the sophisticated world of James Bond! Thrilling Locations provides you with detailed descriptions of elegant restaurants, preeminent lodgings, and sumptuous travel accommodations. Expand the campaign world of the James Bond 007 Role Playing Game. - Floor plans of major locations described in the book! - Encounter Tables providing both obstacles and assistance for characters on a mission! - Descriptions of Non-Player Characters who inhabit the world of James Bond!" "The Lock & Load series will appeal to both players and dungeon masters by providing them with the essential tools needed to build, design and create deep characters and rich adventures within the diverse, steam-powered fantasy world of the Iron Kingdoms. This supplement requires the use of the Dungeons & Dragons Player's Handbook, Third Edition, published by Wizards of the Coast. Nerves of iron are also recommended." "Many centuries ago, a band of paladins fell from grace. These blackguards were defeated after a great battle and their grim fortress, the Iron Tower, was razed. A small abbey was established near the ruins, where generations of monks mixed ancient eldritch wards, mighty clockwork traps, and multiple fail safes to build the Iron Crypt of the Heretics. Three mighty vaults ensured that its evils would be sealed for all eternity. But unbeknownst to the brotherhood, their impregnable crypt had a single weakness: the very monks that had built it, for they knew its secrets. When a devourer stole into their abbey, the profane beast forced the monks to help it inside the Iron Crypt. It successfully broke into the first of three vaults, releasing an army of wights. The story of the devourer and his wight army is told in DCC #012: The Blackguard's Revenge. Now, in DCC #012.5: The Iron Crypt of the Heretics, the heroes must venture into a crypt designed by the world's greatest thieves, magicians, and seers, solve its puzzles and deadly traps, and seal it once more from the outside world." "Every campaign setting has a broad section of the map that is simply colored green. This is the wilderness, an unexplored and dangerous area ripe for adventure, but woefully undefined and undocumented. What does this green swath mean, and what can be found there? Into the Green provides rich detail for four different types of green environments, describing the ecology, terrain, hazards, and resources of each. From tall alpine forests to dark foreboding woods, from lonely and sprawling plains to dense and sweltering jungles, no feature is left out. Into the Green is designed as a guidebook for both players and GMs alike, providing the resources needed to flesh out a wilderness campaign, and the knowledge needed to survive in one. For the GM, Into the Green details the living creatures and the unique conditions that make up each of the four terrains. Trees, plants, animals, microorganisms, monsters, pitfalls, and climates are all included - the complete cycle of life is defined. Along with each of the environments are a wide variety of skills, substances, spells, concoctions, devices, gear, and information invaluable for dealing with the specific hazards of the wilds. Every plant tells a story, every creature provides a clue to success, and every monster is a treasure in and of itself." "In the Shadows is a scenario for Deathstalkers, a fantasy/horror role-playing game that takes place in a dark and foreboding land where the earth-mother goddess has become twisted and insane. Demons lurk in the shadows, the dead rise from their graves to stalk the living, and huge metal juggernauts roam the earth, destroying all that cross their paths. This campaign-caliber adventure takes the players down dark roads and into evil forests; to the heart of a city corrupted by evil - and beneath its cemetery. They'll explore a haunted cabin and sneak around a dark mansion. They'll climb mountains, brave caves, fight monsters, and solve riddles within a tomb of ancient evil. And while designed for new characters, In the Shadows will take even seasoned adventurers for a ride they'll never forget!" Not long ago, a magical vortex released into the lands of Thunder Rift a strange and haunted ship from another time and place. A cursed ship, bad luck for those who see it. The party never wanted to see the ship, much less board it. However, the mystical astrolabe they found must have had great power - at least enough to send them here. Too bad it's missing, now. Will the heroes find a way off the haunted ship, or are they doomed to sail strange seas forever? 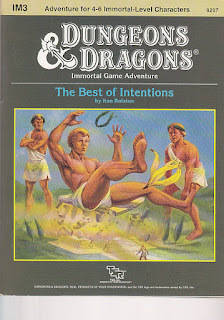 - For use with the DUNGEONS & DRAGONS Game Box"
"Aspects of the Wild is the first in a series of Imagine Bestiary Expansions. The Imagine Bestiary: Aspects of the Wild transports the Imagine game experience into the vast unexplored territories where wild beasts roam and the wild at heart flourish. This volume exists to expand play for the Game Master and player alike. From back cover: Answer the call to dance with the wild. Slip off the beaten path and into the mystical wilderness. Find the untamed beast in your character and release it into your campaigns. Discover new races wild and fantastic, new nature-based classes, new spells and invocations, and a host of creatures mundane and wondrous. Enrich your world - add Aspects of the Wild to your Imagine Role Playing experience." "Prime Plane immortals are dying like flies: nasty, violent deaths. The Hierachs suspect Entrophy, as usual, especially with all the rumors of demo's involvement. To top it all off, one of the Hierachs is missing - Mazikeen. Your Mission as novice Temporals, should you choose to accept it, is to find Mazikeen, uncover his kidnapper, and bring him or her to a court of immortal justice. This entails more than a mere detective job - it also means taking part in the Immortal Olympics and going plane-hopping with the best (or worst?) of them. Adventure fot 4-6 Immortal-level Characters"
"Immortals lie chained atop a mountain in the Broken Lands. Their bonds relentlessly drain their power while demons cavort with glee around the wispy barrier, as strong as any prison. Have you the courage to embark on a dangerous mission for the materials necessary to craft an artifact? If you survive that task, you must then assume the identities of legendary heroes of Darokin and face deadly Immortal foes without revealing your Immortality! The demons of Entropy stand between you and your final goal. Have you the power to rescue the imprisoned immortals and preserve the Prime Plane? The future of the Prime Plane is in your hands!" "Lost? Wandering? Having trouble finding your way? Then this is the product for you, the Judges Survival Pack! Add new heights of excitement to your gaming, more adventure to your play. Here are more villains! More vehicles and chases! Even a combat computer to speed play! 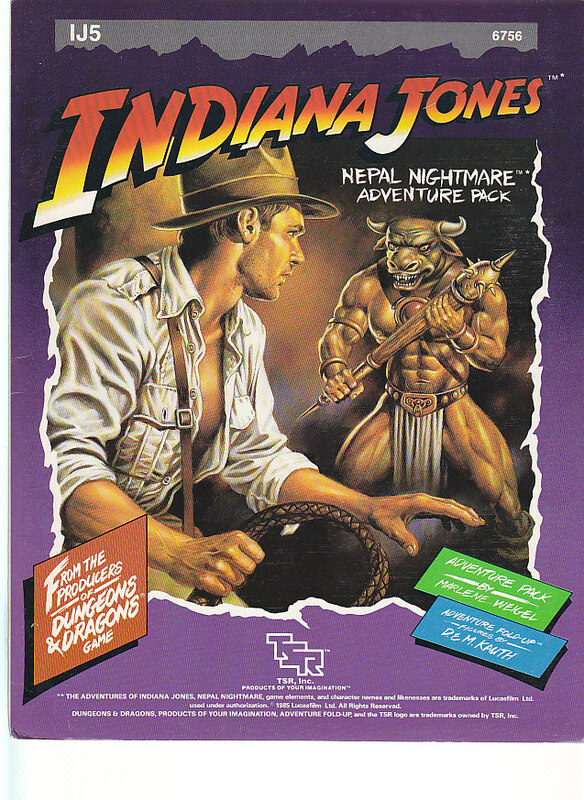 Here are many new aids for all players and referees of The Adventures of Indiana Jones Game. 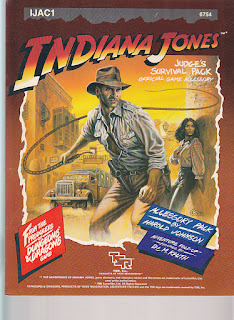 This product features colorful Adventure Fold-Up vehicles for daring - featuring the truck, jeep, staff car and motorcycle from Raiders of The Lost Ark. This in addition to new expansions to the chase rules including stunts and shortcuts as well as new flowcharts and hazard tables will fill your chase with spine tingling excitement. Also included are a second referee screen with new weapons, vehicles and animals. A combat computer you assemble, to speed your adventures along. Ruin maps and a random ruin generation system to create your own havens of antiquity. And much more! This could mean the difference between a dull lifeless adventure and real survival!" "The Fourth Nail?! Dios! What gypsy would not know of it? It was one of our number who stole it, was it not? The petty little thefts of all our people have been forgiven throughout the ages because of that one act . . . so say we, the gypsies! You seek it?! Oh, my friend, do not even hope for such a thing. The Phuri Dai would have me served to wild wolves to even speak of it! I fear that this will not stop you, Indy. Once you make up your mind, you follow it through to the end! And speaking of the end, old friend . . . who are those huge men behind you, all dressed up in those terrible black robes? 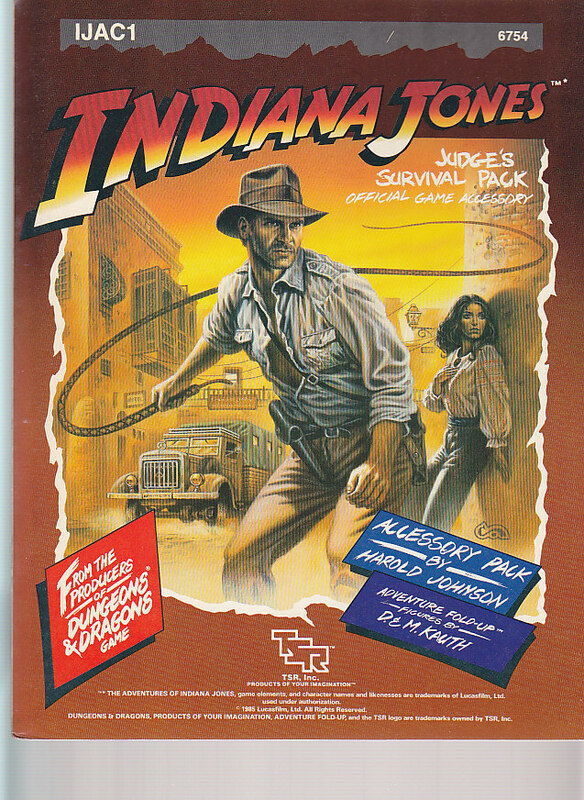 Oh, Indy, how their swordblades gleam! The Fourth Nail - truth or legend? Indiana Jones will not stop until the facts are known." 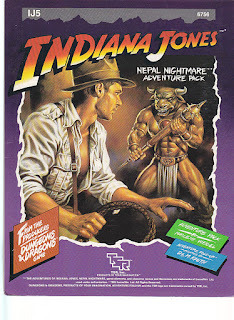 "Terror grips the throat of Indiana Jones as the frail bridge sways in the icy mountain wind! Where moments before only a blank snow-swept ledge stood, there now looms a monstrous dark figure, the ends of the bridge torn free in its claws. Indy's cold-numbed hands slip on the icy ropes. Hard to believe that a simple telegram could have led to this. But then again, that telegram gave Marion hope that she might still find her father alive. Abd Indy knew he would have to join the search for Abner Ravenwood. If ever there was a time for action, it is now! Indy struggles to reach the far side of the bridge, but too late! The shriek of the wind combines with the roar of the beast and with a violent shudder it flings the sundered bridge, Indy, and Marion into the yawning chasm! From the charming isle of Crete with its legendary labyrinth, to the challenge of the snow covered Himalayas, Indiana Jones and Marion face fantastic foes and seek fabled lands in search of Abner Ravenwood. Old foes and new conquests face the greatest adventurer." "The Darkness is almost complete around Indiana Jones. Almost. Robed shadows lurk menacingly ... and they have the Idol, the Golden Goddess! Saad Hassim, owner of the biggest antiquities shop in Marrakesh, sure is getting lots of late business tonight! 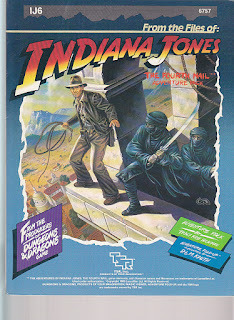 Indiana Jones, never slow to regain his own, springs into action! How? 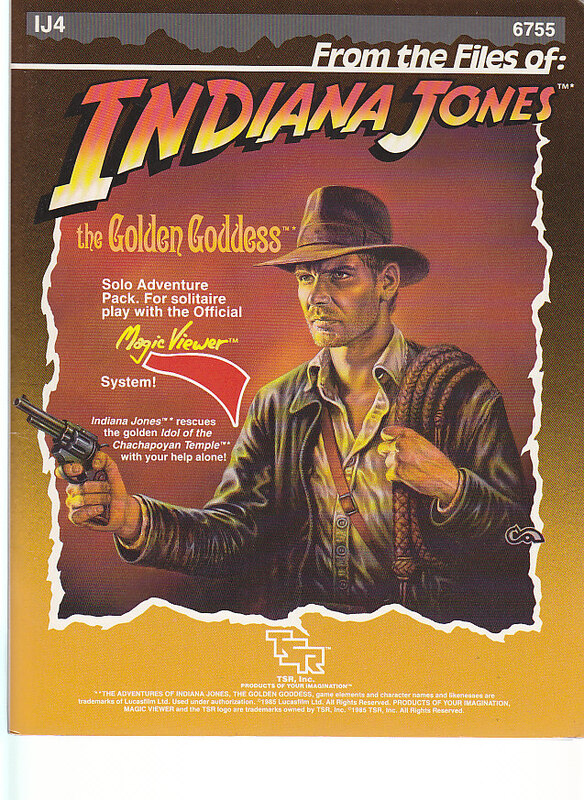 From Marrakesh rooftops to New York City skyscrapers, Indy tries desperately to capture the Idol lost so long ago to that villain Belloq. He does it under your direction alone. 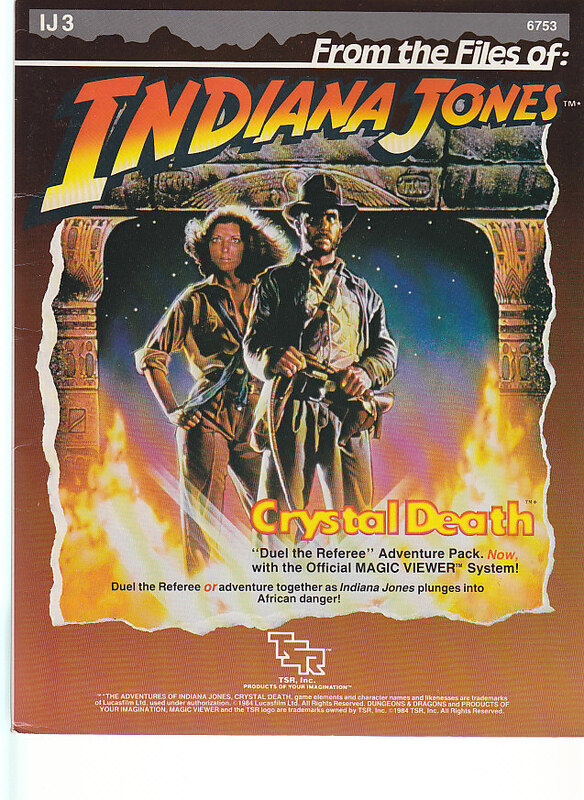 Your skill in surmounting the dangers, your ability to survive the rigors of the chase, will determine if Dr. Jones comes away with the Idol ... or not at all. 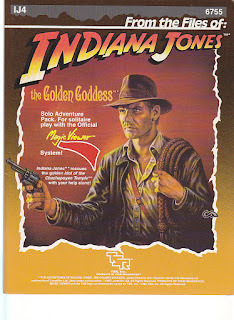 The Golden Goddess Adventure Pack can be played as a solo adventure with you as Indiana Jones against the mysterious forces arrayed against his quest for the Idol, or modified by a referee to be run as a group adventure." "Bullets chip and spark as the machine gun empties into the wall behind Indiana Jones. Some monastery! These goons may wear monks robes, but that doesn't make them saints by a long shot! From the French countryside to the steaming heart of Africa, Indy sets out on a fantastic adventure that tests his skills...and the skills of those who guide him. 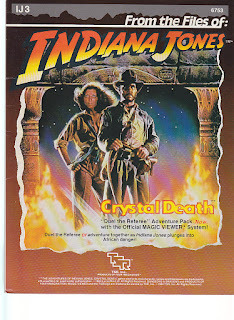 The CRYSTAL DEATH Adventure Module can be played as a standard group adventure or as a special duel where you pit all your gaming experience against the skill of your friends." "The International Fantasy Gaming Society (IFGS) is a non-profit organization created to design and run live-scale, SAFE outdoor fantasy games. Our system includes eight character classes and has mechanisms for fighting (with mock, padded weapons) and for casting spells. This book contains the rules for fantasy games, along with information about how to contact the IFGS and design your own games. We invite you to join us in an exciting organization devoted to fantasy gaming!" Inner City Games Design - Fuzzy Heros: Heroes In Space! "This is the voyage of the starship Centipede. Its mission: to help the Fuzzy Heroes new Alien friends regain their Lucky Star. To defeat the Renegades that have taken the Lucky Star by force, driving them back to their holdings in FrolicHaven. To make space exploration safe for all toy kind." System neutral character sheet released by Inner City Games in 1997. Not much to be said about them. 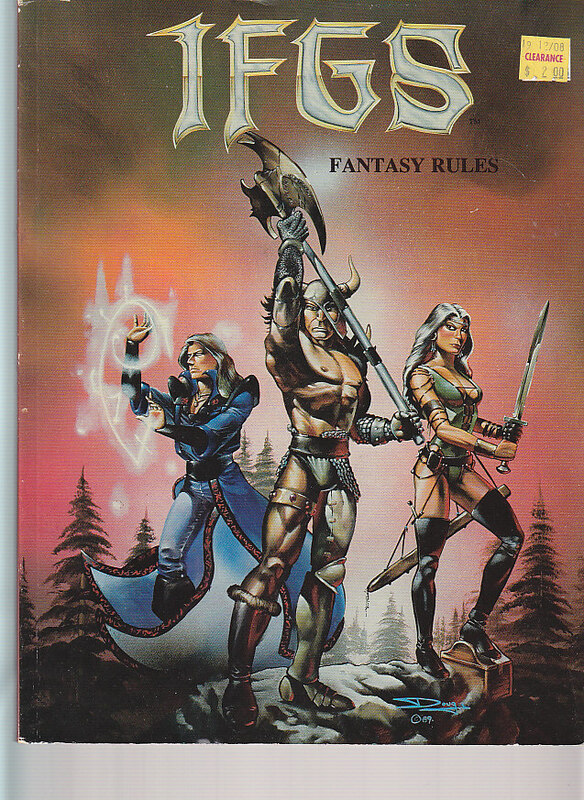 "The Iron Wind, 2nd Edition was one of the first gaming modules for Rolemaster. The 50-page module recounts the tales of demons, assassins, and evil elven priests in the snow-covered islands of the Iron Wind. The book includes a glossary, maps, charts, and illustrations. Notes: There are different variations of this module. There was an initial printing of 5,000 on golden parchment with a black-and-white cover. A later first edition has a multi-color illustration. This first edition version has 68 pages." "This is the first of the Loremaster Series, a group of fantasy aids designed to each provide the background for a complete campaign of any level. Laid out for your players on the four-color map are no less than 5 dungeons and 3 cities through which they may search for riches or death. But worlds are not all towers and dungeons, so the Loremaster series provides the cultural and political background for a series of wilderness adventures as the players journey across the map learning about their world. Two maps (scale 1" = 20 miles) are provided, one labeled with suggested locations for each city or dungeon, so that you can release to the players just the information their characters might actually have. The dungeons and citadels are shown in sinister perspectives and laid out with numbered, keyed, floor plans - ready for you, as Gamemaster, to people them with creatures that will provide an appropriate challenge for your players. A second volume in this series is currently in development to allow you to widen the scope of your player's adventures and more will be forthcoming. Also available (by Spring '81) is a full-color continental map done in the same style as the back cover of this booklet. Ten million square miles of forests, savannas, steppes, deserts, mountains, islands plains and lakes on a 24" x 36" poster-sized map. Look for it at your hobby store." In Kulthea's Second Era of Ire, a Dwarven king hollowed out vast caverns high in the Garlon Mountains of northeastern Jaiman. His citadel atop the mountain was guarded by a gate - to reach it, guests climbed an immense brass stair a hundred miles up in the rugged cliffsides. As the Wars of Dominion raged, servants of the Unlife gained control of the Narlshaw region, and the Dwarves' gold mines were abandoned. Bewildering Flows of Essence divide the Narlshaw from the rest of Jaiman. The Dragonlord's Skyriders patrol the chilling air. Tales of a huge Dragon flying over the Brass Stair and of Cloudlords astride their soaring mounts make the region ill-at-ease. In a land where all fear the Dragonlord and few serve the Good, adventurers seek ancestral treasures in an atmosphere of ever-increasing danger." "Set sail for the land of the silver Mist, where treasure and undead alike rest uneasily in the ruins of Quellbourne's capital city, Quellburn. Overcome by the forces of the Unlife centuries before, the rugged Mannish population of this fog-swept land struggles to survive, battling pirate bands of Ice Krals and raiding Trolls, as they mine for gold and silver. Fortune hunters will find Quellbourne bountiful, if they can avoid being sacrificed to the Spider Goddess, Hrassk. Equally fatal are the Destroyers of Galtoth, a cult of men dedicated to destroying everything -- even the island they live on! Riches and tales too fabulous to be believed lure adventurers to Quellbourne's battered coast. The bold may find a map leading to an "abandoned?" silver mine, now home to denizens best left undisturbed. After outfitting themselves on the brawling streets of Kelfour's Landing, fortune-seekers might prowl the ruins of Quellburn, uncovering centuries of gold and booty. Or sail to Trelkinaark to challenge the formidable and plunder-laden Krals in their homeland. * 2-page color map of Kelfour's Landing. * View and Room-by-room Layouts of Quellburn's Armory, Citadel of Wizards, Palace and more. "Vast caverns thread the earth beneath the continent of Emer. One of these natural vaults contains a realm of bronze sands and silver grasses lit by a magical sky-roof of brass. Six immortal, evil lords - the Ishru - reside in castles overlooking the deserts and the steppe. They vie among themselves for supremacy, unaware that their holdings may all be destroyed by events set in motion millennia in the past. Long, long ago, one of the fallen great - a Worldslayer - fashioned Gethæna under the wastelands of central Uj. The vast lava dome housed her demon armies. The hordes were to be unleashed only when her deluded foes foresaw victory. Gethæna’s creator and all her scheme’s have been forgotten by history - yet her legacy lives on. Within the crucible of the underearth realm, an ancient people struggles amidst the atrocities committed by the Ishru. One man plans to loose these fiendish lords on Kulthea’s surface, while all others seek their destruction. Treachery, rebellion, and the chances of war challenge adventurers in Gethæna! * A 21" x 16" full-color map of Gethæna. * A complete campaign involving seven linked scenarios that send adventurers into the perilous heart of Gethæna’s enduring mysteries. * Details on the Ishru, the immortal fiends who rule the Underearth Realm. * A history of the ancient conflict between the dark Ishru and their neighbors, the mortal Dain Sædhu. * Legends from the birth of the world. * Flora, fauna, and beasts unique to the Underearth Realm, including the savage gleamtiger, soporific sorrow moss, and the bloodthirsty Nuld - minions of the Ishru. * Politics and power: who pulls whose strings, and the web of intrigue that enmeshes all - the rulers and the ruled. * Maps and layouts for all adventure sites. * Complete statistics for all NPCs, monsters, artifacts, and poisons. * New spell lists for the Ishru and those foolish enough to study under these cruel lords."